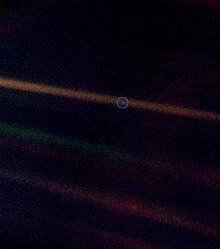 You see that pale, blue dot? That's us. Everything that has ever happened in all of human history, has happened on that pixel. An Inconvenient Truth is a documentary film about climate change, specifically global warming and a future ice age in Northern Europe, presented by former United States Vice President Al Gore and directed by Davis Guggenheim. A companion book authored by Gore has been on the paperback nonfiction New York Times bestseller list since June 11, 2006, reaching #1 on July 2, 2006. The film won the 2007 Academy Award for Documentary Feature and Best Original Song for Melissa Etheridge's I Need to Wake Up. I've been trying to tell this story a long time, and I feel as if I've failed to get the message across. There are good people, who are in politics — in both parties — who hold this at arm's length, because if they acknowledge it and recognize it, then the moral imperative to make big changes is inescapable. 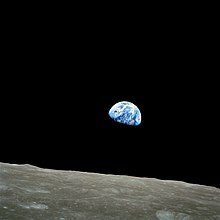 They looked up and they snapped this picture, and it became known as "Earthrise" And that one picture exploded in the consciousness of humankind. It led to dramatic changes. Within 18 months of this picture being taken the modern environmental movement had begun. On the first pictures of the Earth as a full globe taken by the Apollo 8 crew. The struggles, the victories that aren't really victories, the defeats that aren't really defeats, they can serve to magnify the significance of some trivial step forward, exaggerate the seeming importance of some massive setback. Making mistakes in centuries and generations past would have consequences that we could overcome. We don't have that luxury anymore. Old Habits plus Old Technology have predictable consequences. Old Habits, that are hard to change, plus New Technology can have dramatically altered consequences. We have to think differently about war. Because the new technologies so completely transform the consequences of that old habit that we can't just mindlessly continue the patterns of the past. It takes a sudden jolt sometimes for us to become aware of a danger. If it seems gradual, even if it really is happening quickly, we're capable of just sitting there and not responding, and not reacting. It's just human nature to take time to connect the dots. I know that. But I also know there can be a day of reckoning, when you wish you had connected the dots more quickly. There are three misconceptions in particular that bedevil our thinking. The first: isn't there a disagreement among scientists as to whether the problem is real or not? Actually... not really. I guess the thing I've spent more time on than anything else in this slide show is trying to identify all those things in people's minds that serve as obstacles to them understanding this. And whenever I feel like I've identified an obstacle I try to take it apart, roll it away, move it, demolish it, blow it up. I've set myself a goal: communicate this real clearly. The only way I know to do it is city by city, person by person, family by family, and I have faith that pretty soon that enough minds are changed that we cross a threshold. We have everything we need, save perhaps, political will. But, you know what ... political will is a renewable resource. ... The solutions are in our hands. We just have to have the determination to make them happen. I believe this is a moral issue. It is your time to seize this issue. It is our time to rise again, to secure our future. You see that pale, blue dot? That's us. Everything that has ever happened in all of human history has happened on that pixel. All the triumphs and all the tragedies, all the wars, all the famines, all the major advances.... It's our only home. And that is what is at stake: our ability to live on planet Earth, to have a future as a civilization. I believe this is a moral issue. It is your time to seize this issue; it is our time to rise again to secure our future. This page was last edited on 27 November 2017, at 16:57.